Rega RP1 Performance Pack review | What Hi-Fi? 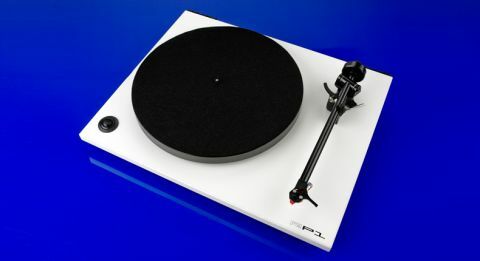 We’ve always been fans of the Rega RP1. It’s a brilliant entry-level turntable. We liked it enough to give it five stars and, eventually, an Award. But that was a few years ago. Today we’re dealing with an enhanced version: the Rega RP1 Performance Pack. Mostly, this is the same turntable we know and love, but with a few key tweaks. For starters, there’s a new, thicker drive belt. You also get a new mat: it’s thicker too, and made of natural wool, as opposed to the synthetic material of the original (for better damping and reduced resonance). The moving-magnet cartridge is new, too. The standard Ortofon OMB5 has been replaced by Rega’s own Bias 2. We’re told it’s hand-assembled, with an elliptical stylus and parallel wound coils, and quality-tested for two days. You can get the Rega RP1 Performance Pack factory fitted, as we did. But if you already have the turntable, you can buy the parts separately as an upgrade. That will set you back about £85. Elsewhere, it’s a standard RP1. You get a simple rectangular plinth with three rubber feet. The plinth carries a superbly-made main bearing and the RB 101 tonearm – a simplified version of Rega’s highly regarded RB 300. The platter is made of phenolic resin (read: fancy plastic). Speed change is manual: you have to take the platter off and move the drive belt by hand. This really is a basic turntable – which is fine if it means more attention is paid to its engineering. You can get the turntable in matte black, white or grey. There’s also a version pimped out with the Union Jack. Setting up is about as simple as it gets. The cartridge comes pre-fitted. The ideal counterweight position is marked on the arm, so it’s merely a matter of attaching the weight itself. Just set the bias – a slider under the tonearm – and you’re off. As always, careful placement is key. Be sure to use a flat, stable surface, preferably far from your speakers (or any other source of vibration). The original RP1 was a terrific performer for the money, but the Performance Pack bumps up the quality further. It’s a surefooted, confident sound whether you spin an older, scratchier record or a fresh pressing. There’s a good sense of rhythmic drive, while the dynamics are strong and wide. We put on Nirvana’s Nevermind and the opening drum whacks of In Bloom are properly thrashy. It’s a detailed sound: there’s plenty of texture, as well as a pleasing degree of transparency, which was never the greatest strength of the standard RP1. The Pro-Ject Debut Carbon does have a slight edge when it comes to absolute insight. Then again, the Rega counters with a weightier, more exciting sound. We really like the Rega RP1 Performance Pack. It’s a blindingly good turntable for the money, and a great entry point into the world of vinyl. And if you’re already the proud owner of a standard RP1, this is an upgrade you should consider.